The Chef’s Studio: A place to learn how to cook, or simply polish up your rusty skills in the kitchen. 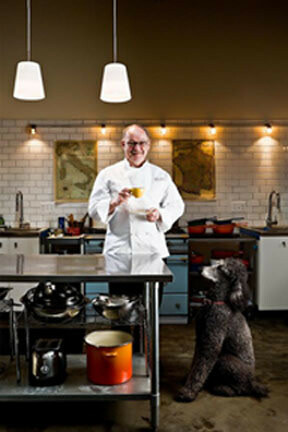 Robert Reynolds is Portland’s expert in all things delicious, French… and Italian too. Robert Reynolds no longer has a restaurant, but his culinary chops are right up there with our nation’s best. And when it comes to French cooking, he’s the go-to-guy in Portland. His Portland atelier, the Chef’s Studio, is a kitchen, a table, and lots of utensils and books, where inspiration and knowledge are top shelf. I first discovered Reynolds in the 80’s when I lived in the Mission District. Back then, pre-dot-com San Francisco was a unique place, buzzing with bohemians. A few blocks away from our flat was a tiny jewel box of a restaurant called Le Trou. I took regular walks to peek through the window and watch the chef chopping away, getting ready for the nightly meal. I would study the menu posted on the door, and dream about going there one day. Sadly, I was a struggling art student and never made it to dinner there. Little did I know that years later I would share a different city again with this talented chef, Robert Reynolds. Lucky for me, when I moved up to Portland, a friend invited me to dinner at the Chef Studio, Reynolds’ cooking school and atelier. That night I had one of the most delicious meals ever. Robert cooked and served the two of us six beautiful courses, pouring wine and champagne as his sauces simmered and the fish roasted. Not only did I fall in love with his cooking, but I fell in love with his heart and soul. To me, the best cooks are the ones that strive to make others happy. Egos don’t really have a place in the kitchen, because as any good chef will admit: there’s always more to learn. So even if you think you know your sauces inside and out, or your knife skills are good enough, there’s always more to discover. That’s what the Chef’s Studio is all about. Robert will explain methods, techniques, physics, and chemistry to produce delicious food. Kitchen work is hands-on, and closely supervised. Each day’s menu is enjoyed at table and paired with wine. Each session will have only 6 students.